BAT - BLOG : BATMAN TOYS and COLLECTIBLES: New #DORITOS Packaging Featuring #BATMAN V SUPERMAN Movie! 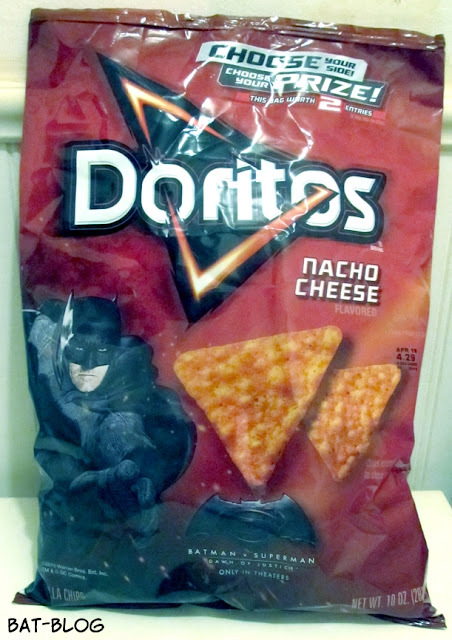 New #DORITOS Packaging Featuring #BATMAN V SUPERMAN Movie! OK, some of you might be tired of all the BATMAN V SUPERMAN MERCHANDISE posts today, but you know what? That's too bad! Hey, I think this movie is gonna be great! At least I'm hoping so. Anyways, I just wanted to share one more item that I came across while shopping for groceries last night, Doritios Nacho Cheese Chips!! Now, the Grocery Store I shopped at (Walmart) only had this one bag that featured "Batman" but I know they will show many more, probably one character on each of their different flavor varieties.